Make sure to check out my other embarrassing folies here . I don't know why I tell you people these things. Sigh. Now that's one I've never done! You crack me up! No I haven't done that but I have worn my shirt inside out. Sigh. I've seriously wondered about my mind in the last year. More than once I've discovered I've got my shirt, jumper or dress on backwards when I'm out in public. Definite signs of aging, I think! What's weirder is when I discover it, I'll try to change it whereever I am. Didn't go well in church. Hmmm... Guess that's better than realizing that you totally forgot to put pants on??? lol. 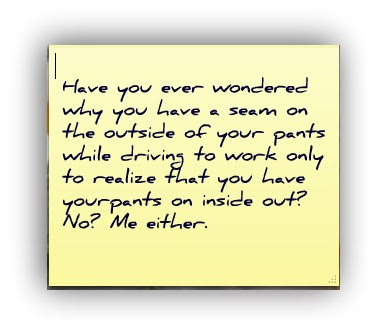 Too funny, and yes, I too have dressed in the dark to my detriment. You do it because we can SO IDENTIFY! I've done shoes and socks of different colors. Getting dressed in the dark can be a problem! Thanks for the laugh! Does different shoes, brown shoes with black skirt, or tag sticking up on the outside of my turtleneck count? I have driven off with my shoes on top of my car and didn't realize until I got to school and the weren't there.--- But I have NEVER driven to work on my day off. NEVER! !